Slava is exceptionally smooth, balancing a warm, distinctive character and a long, elegant finish. It is superb taken neat and creates cocktails and martinis that are clearly superior. For those in the know, Slava Ultra Premium is the best made vodka in the world. 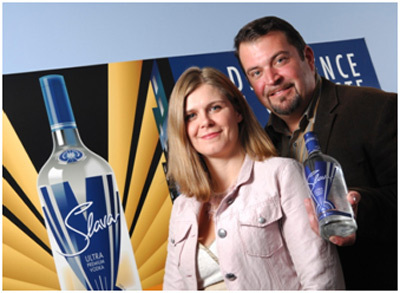 Slava is owned by a Canadian company and was started by John and Katherine Vellinga. They discovered a gem of a vodka factory located in the Cherkasy region of Ukraine, the birthplace of vodka. The factory was built in 1896 in the village of Zolotonosha to take advantage of the perfect source of artesian mineral water. Both John and Katherine are Engineers by training and had worked extensively with breweries and wineries in Ukraine while living there from 1997-2002. In 2002, Vellinga set out to create a vodka that would be the best made in the world. He began to work with Chief Technologist, Ludmilla Petrivna who holds a PhD in vodka. Yes, they have those in Ukraine, which shows how seriously it is taken there. First three benchmark vodkas were selected through a series of blind taste tests with a panel of 44 vodka drinkers – as the best tasting vodkas currently on the shelf. These three benchmarks were the ones to beat. It took 25 versions of Slava to accomplish this. Each time, Petrivna and Vellinga would make changes or fine tune the formulation based on feedback from the taste panel. One key factor in the success of the formulation was the use of quadruple distilled spirits, which provides the perfect balance of smoothness and character. Distill it less than four times and it was too harsh. Distill is more and it became tasteless and flat. Another key was the use of centre cut spirits, sometimes called sweet spot or the Tsar’s cut (legend has it that the tsar would claim these for himself, while regular people would get the rest). This eliminates the lighter spirits – which cause the medicinal aroma present in most vodkas, and also the heavier spirits, which causes the burning sensation people get when drinking many vodkas. Finally, filtration was a major factor. Slava is slow filtered through seven massive, two and a half story columns, each with 300 kilograms of birch charcoal. Five quartz sand filters are connected in between. This is a far grander, slower but much gentler form of filtration. It is the reason why Slava makes cocktails that taste better. The vodka is purified, while leaving the subtle flavours intact. Have you ever noticed that a juice (especially orange) will go slightly sour and have an alcohol smell once most vodkas are added? Well Slava does the exact opposite. It cuts the acidity of a mix and enhances the flavour. Finally, Slava got a proprietary treatment after filtration that makes it less acidic than most vodkas, which gives it a velvety mouth feel when taken neat and further enhances the taste of the mix when put in a cocktail. At the same time as working on the formulation, Vellinga was receiving designs and quotes for the bottle from companies across Ukraine and Europe. 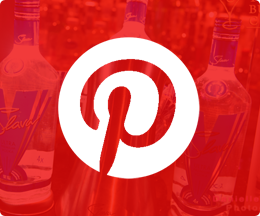 Initially, he wanted to use a pretty, frosted and silk screened bottle like other ultra premium vodkas on the market. That is, until he found out how much they cost! With all of the mark ups and taxes, consumers would be paying $15-$20 more if Slava were packaged this way. This seemed pointless. So Vellinga opted for a bottle that was less costly but better by design. Many connoisseurs like to put vodka in the freezer. Slava created a shorter, three-sided bottle that easily fits in any freezer (even a small one). The timeless art-deco label and concept was created by a Canadian artist and refined for the triangular bottle. It took almost two years to complete the formulation and design of Slava. In fact, it was the 23rd of 25 formulations that won, with nearly 70% of the panel picking #23 over the other five vodkas, an astonishingly convincing win. But it was worth the wait. They have created a vodka like no other.